Vince McMahon and “Million Dollar Man” Ted DiBiase are on commentary. Both men will also compete later in the Royal Rumble match. Bigelow is replacing the injured Ludvig Borga here. He tries to attack from behind before the bell but Tatanka is ready for him. Tatanka unleashes a flurry of offense and then keeps Bigelow on the mat. He hits a nice DDT and goes up top but misses a high cross body block. That gives Bigelow the advantage and he makes the most of it. Every time Tatanka tries to build some momentum, Bigelow cuts him off. Finally, Tatanka fights up and they collide mid-air with simultaneous cross body block attempts. Back on their feet Tatanka is doing the war dance but Bigelow slices him down with an enziguiri and then mocks him. Bigelow goes up top for the moonsault and he misses it. Tatanka goes up top and hits a cross body block for the win at 8:13. That was a perfectly acceptable opener between two well-matched opponents. As a kid I Was really annoyed that Borga wasn’t in this match, but I think it was probably better this way, despite not getting the Borga/Tatanka blow-off. An excellent video package shows all the history between Bret and Owen Hart since the Survivor Series. Owen was starting to feel like he was living in Bret’s shadow and wanted to wrestle him just to see who the better man was. Bret refused to fight his brother and they patched things up, deciding to go after the World Tag Team Titles instead. Meanwhile, The Quebecers lost the titles to Marty Jannetty & The 1-2-3 Kid on January 10, but regained them the following week at MSG. Jacques and Pierre have been the Champions since 1.17.94 and this is the first defense of their second reign. McMahon calls Bret and Owen the greatest tag team ever. Bret and Pierre start the match, and Bret takes the early advantage for the Hart duo. Jacques and Owen tag in, and the results stay the same. The Quebecers try to cheat to take control, but the Harts run them both to the floor. Much like the opening match, both Hart brothers will compete in the Royal Rumble later tonight. Pierre catches Bret with a nice powerslam and now the Champions take control for the first time. Pierre goes to the second rope but jumps right into Bret’s boot. That allows Bret to make the hot tag and Owen is a house afire. Owen locks Jacques in the Sharpshooter but Pierre gets the referee distracted by Bret, and he’s able to then break up the hold. Moments later Owen dropkicks both Quebecers at the same time and then makes a tag. The crowd is super-hot for everything Bret and Owen do by the way. Bret is unleashing some of the Five Moves of Doom and looks like he’s ready to win the titles. The Champs use some chicanery to send Bret crashing hard to the floor on his knee. Jacques and Pierre smell blood in the water and viciously attack Bret’s knee. Things are not looking good now, as Bret can barely stand. The Quebecers isolate him, but they miss the Cannonball. Bret selfishly tries to put on the Sharpshooter rather than go for a tag, but he can’t put any weight on his knee, so the referee calls for the bell at 16:46. The finish was a little anti-climactic, but it plays perfectly into the storyline and gives a good reason for the post-match antics. The match before the finish was very good, a classic tag team encounter helped greatly by the crowd’s love of Bret and Owen. This is probably the best Quebecers match out there. After the match Owen is furious with his brother for not tagging him and chooses not to help Bret get to his feet. As soon as Bret stands up Owen kicks his leg out of his leg, completing one of the best executed turns I’ve ever seen. The crowd is shocked to say the least. On his way to the back Owen acknowledges that Bret was hurt and says that he just should have tagged him. Owen says Bret is just too damn selfish. Todd Pettengill gets a further word with Owen backstage, and he’s still fuming. Owen blames the loss on Bret, chastising him for being selfish. It’s a great, impassioned promo by Owen until he drops one of the most famous flubs, telling Bret that’s why he kicked his leg out of his leg. Owen promises to win the Royal Rumble later tonight and earn a WWF Title shot. Jim Ross and Gorilla Monsoon take over on commentary for this match. Ramon has been the Champion since 10.11.93 and this is his third major defense. He throws his toothpick at IRS and gets slapped in the face for it. That just fires up the Champion and he chases the challenger to the floor. Back in the ring IRS goes to work with some brawling tactics. That’s a losing battle against a guy like Razor Ramon. IRS takes a powder to regroup. It takes a minute to pay off, as Ramon unloads a flurry of offense for a near-fall. Moments later IRS sidesteps a charging Ramon and dump him to the floor. IRS follows him out and throws him into the steel steps, and then flattens him with a clothesline. Ramon makes it back to the ring before the count of 10. IRS pounces and immediately tries to put Ramon away. He keeps Ramon on the mat with a reverse chinlock. Ramon powers up and hits the Fallaway Slam for two. The referee gets in the way and takes a bump. IRS tries to hit Ramon with the briefcase, but it backfires, and Ramon lands a shot with the foreign object. But the referee is down so there can be no count. Ramon puts IRS on the top rope and hits the belly-to-back superplex. He signals for the Razor’s Edge and Shawn Michaels runs out and drills Ramon with his version of the Intercontinental Title belt. Now all three men are down. IRS and the referee show signs of life and IRS makes the cover and gets the pin! The bell doesn’t ring though, which is important. Referee Earl Hebner comes down to tell original referee Joey Marella what happened, even showing him the second title belt. In the confusion, Ramon hits IRS with the Razor’s Edge to get the definitive pin at 11:46. That was a perfectly adequate mid-card match that also helped build toward one of the greatest matches ever at WrestleMania X, so I have no issues with this. Yokozuna has been the Champion since 6.13.93, and this is his fourth major defense. Undertaker fires right away, taking Yokozuna down with a clothesline and upper-cutting him to the floor. The Dead Man continues to dominate both in and out of the ring. Yokozuna tries to use a chair but it backfires, and Undertaker uses it instead. Finally, Yokozuna subdues Undertaker with a handful of salt to the eyes. The Champion gets to use the chair now, and Undertaker is in rough shape. Back in the ring Yokozuna continues using his immense girth to keep Undertaker on the canvas. Yokozuna shoves Undertaker into the casket and tries to close the lid but Undertaker isn’t ready to go down yet. They trade shots and Yokozuna grabs a belly-to-belly suplex. Undertaker sits up and delivers a (sort of) Chokeslam. He hits a DDT and puts Yokozuna in the casket, but before he can close the lid Crush comes out to attack. Crush is soon joined by Kabuki, Tenryu, Bam Bam Bigelow, Adam Bomb, Jeff Jarrett, the Headshrinkers, and Diesel. Undertaker valiantly tries to fight them all off, but the numbers game is just too much for him. Somewhere in all the mess, Yokozuna takes the urn from Paul Bearer and removes the lid, at which point green smoke starts pouring out. Apparently, that’s the power of the Undertaker, because he succumbs to the 11-on-one beatdown and they lock him in the casket to give Yokozuna the win at 14:25. People dump on that match, and while it’s not great it’s far from horrible. They were having a decent brawl before the heel locker room came out, and at the time this was unheard of in WWF and blew my 11-year-old mind. I mean why wouldn’t you try to get 10 extra guys to help you beat the Undertaker? And this also helped explain his absence until August. The real fun part though, is after the match when the Undertaker pops up on the Titan Tron from inside the casket. Undertaker cuts a silly promo and then ascends out of the Titan Tron and apparently up to heaven? I think this certainly hurts peoples’ perception of the match, because it truly is one of the dumber things WWE has ever put together. Scott Steiner drew #1, and Samu is #2. The intervals are going to be 90 seconds this year. Scott and Samu brawl for a bit and then Rick Steiner comes in at #3. That doesn’t go well for Samu, who quickly gets eliminated. Kwang (a replacement for Ludvig Borga) is #4, and he spits green mist into Rick’s eyes. Scott comes to the rescue and beats on Kwang in between checking on his brother. Owen Hart is #5 and he goes right after the weakened Rick and eliminates him. Bart Gunn comes out at #6. Not much happens and then Diesel makes his way out with lucky #7. Diesel tosses Bart and then Scott. Owen is next to go, and then Diesel tosses Kwang to have the ring all to himself. The crowd is going nuts, and the term “Diesel Push” is born. The veteran Bob Backlund is #8. Backlund tries to go after the legs but Diesel quickly dumps him out. Billy Gunn is the #9 entrant and he goes right after the big man. Diesel will have none of that and hurls Billy right out. Backstage, Lex Luger is attacked by Tenryu and Kabuki, leaving his status in question. Next up at #10 is Virgil (a replacement for Kamala), and Diesel makes short work of him for his seventh straight elimination. Finally, some real competition comes out as Randy “Macho Man” Savage is #11. They fight back and forth and neither man can eliminate the other. Jeff Jarrett is the #12 entrant, and he attacks Savage rather than Diesel. Jarrett thinks he eliminated Savage, but the Macho Man skins the cat and dumps Jarrett to the floor. Next up at #13 is Crush, the mortal enemy of Randy Savage. After surviving Savage’s initial onslaught, Crush and Diesel work together on the former WWE and Intercontinental Champion. Doink the Clown is out next at #14. Crush eliminates Savage just before Doink gets to the ring. Doink is content to watch Diesel and Crush fight each other. The big men take exception and Doink attacks them with shenanigans. That doesn’t last too long, and Bam Bam Bigelow brings us to the halfway point at #15. Bigelow quickly press slams Doink to the floor. The three big men brawl for a bit but can’t eliminate anyone. We start the second half with Mabel at #16. Mabel cleans house. Sparky Plugg (replacing 1-2-3 Kid) is #17, and I believe this is his debut. The self-proclaimed Shawn Michaels is the #18 entrant. Michaels’ bodyguard Diesel looks like he’s going to go after him, but they shake hands instead. That allows Mabel, Bigelow, Crush, Plugg, and even Michaels to eliminate the juggernaut, who gets a huge ovation on his way to the back. Next up at #19 is Mabel’s partner Mo. Men on a Mission try work together, which can be a helpful strategy. Michaels is so good that he makes it believable that Mo could possibly eliminate him. Former Intercontinental and World Tag Team Champion Greg “The Hammer” Valentine is #20. Not much happens until Tatanka comes out at #21 and goes right after Michaels. The Great Kabuki is #22, and the ring is looking full now. 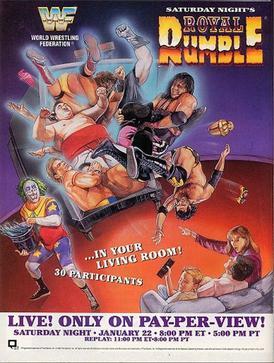 It takes Valentine, Tatanka, Kabuki, Crush, Bigelow, Plugg, and Michaels (everyone in the ring except Mo) to eliminate Mabel. Lex Luger comes charging out at #23 and he is a house afire! Luger immediately throws Kabuki to the floor and then turns his attention to Crush. Next up is Tenryu at #24, and he will be operating without his partner Kabuki. The buzzer rings for #25 and nobody comes out. McMahon speculates that this was Bret Hart’s spot, but he is too injured to compete. Rick “The Model” Martel is #26. He has had some success in past Royal Rumbles. The crowd explodes as Bret Hart is #27! Hart gimps his way to the ring and that injured knee has a huge bullseye on it. Headshrinker Fatu is #28 and the ring is totally full now. Luger, Plugg, and Bret eliminate Crush. Marty Jannetty is #29 and he goes right at his former partner Michaels, hitting him with a superkick. The final entrant at #30 is Adam Bomb, and McMahon declares that he will be the winner. Bret and Michaels eliminate Plugg. McMahon notes that Bastion Booger was feeling “a little sick” so he did not come out in the twenty-fifth slot. Martel eliminates Valentine and Tatanka eliminates Martel. Luger dumps Bomb to the floor and Bigelow gets rid of Tatanka. Next to go is Bigelow, courtesy of Luger. Michaels gets the better of Jannetty yet again and eliminates him. Luger and Bret eliminate Tenryu, and we’re down to the Final Four! Bret and Michaels pair off while Luger and Fatu do battle. Michaels and Fatu look a little fresher and they take control, even working together to try and eliminate Luger. That doesn’t work just yet and Luger gets all fired up. Michaels and Fatu both get whipped toward a corner and get simultaneously eliminated by Bret and Luger, who are now the final two. They slug at each other briefly and Luger picks Bret up, but Bret uses momentum to send them both tumbling to the floor at the same time. No bell rang, but they hit the floor at about 55:05. The referees are confused about who hit the floor first. Referee Joey Marella declares Luger the winner, but Earl Hebner disagrees and declares Bret the winner. WWF President Jack Tunney makes his way out to sort it out, as McMahon and DiBiase look at the instant replays. To me it looks like Bret hit the floor first, but they did a good job of making it look super close. After much hemming and hawing, Howard Finkel announces that both Hart and Luger are the winners, putting the WrestleMania X title shot up in the air. At any rate, this was a fun Rumble with lots of great talent. They had a great story with Luger and especially Bret overcoming the odds to make it to the end, and the co-winners is not that bad of an idea. I like this Rumble probably more than most and add the Tag Team Title plus post-match and this becomes a show I’m happy to recommend. This is one I had taped on VHS from the broadcast when I was a kid and watched a lot, so it holds a soft spot in my heart.